“We saw this at Frankfurt; we never expected to see it at Horsham!” was one such exclamation from a delighted visitor last Saturday after the successful launch of ‘Matisse: Drawing with Scissors’―the new month long exhibition at Horsham Museum & Art Gallery. 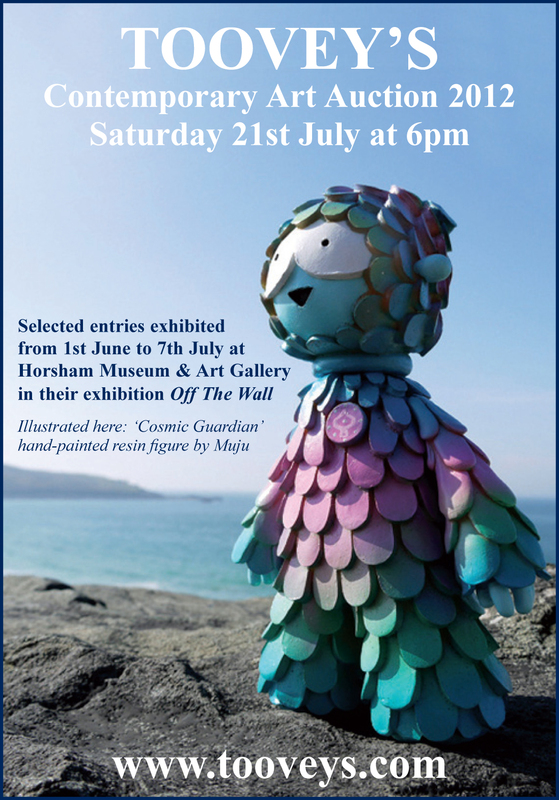 Thanks to support from Toovey’s auctioneers and in association with Horsham District Arts, the Museum should be hearing further exclamations of delight as this summer sees a showcase of truly great and remarkable art. 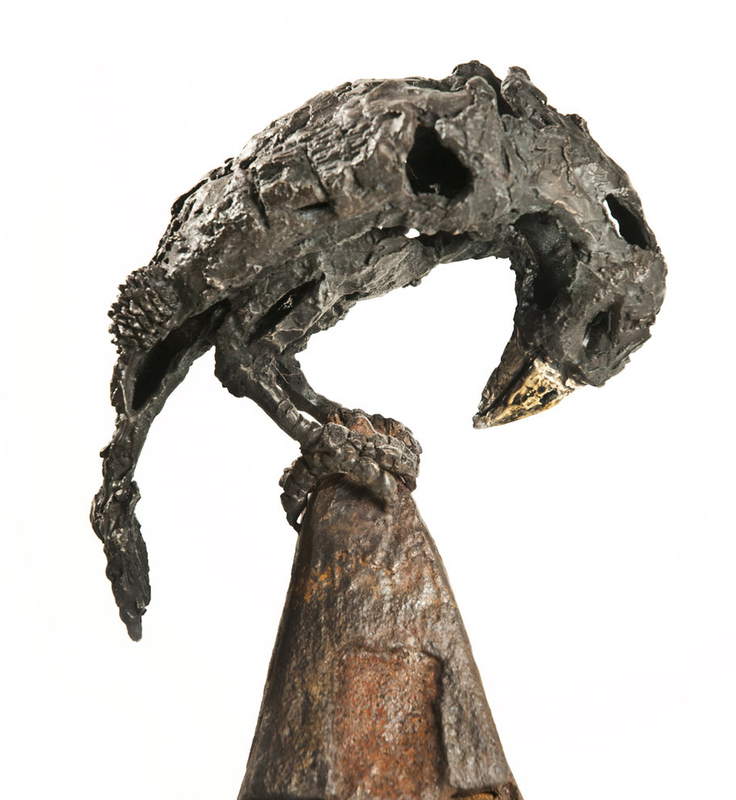 From May to mid-September Horsham Museum and Art Gallery has pulled together a fantastic exhibition programme. After a year of discussions and networking, using the connections brought together by Horsham District Arts working with Toovey’s and University of Chichester Bishop Otter Gallery, the public have the chance to see great contemporary art with a focus on British art of the 20th and 21st centuries. Following on from the riot of colours and shapes that is the Matisse exhibition, the Museum hosts ‘Off The Wall’ where 50 artists and craftspeople display their finest work in a preview show for the best Contemporary Arts Auction to be held in the South East. Using his contacts and a great deal of persuasion Nicholas Toovey has curated an exciting showcase, which Horsham Museum & Art Gallery is delighted to host. With artists of the calibre of Chris Kettle, Christine Tongue, Eve Shepherd and Muju, we know the public will value the opportunity to see, debate and be inspired by this fantastic collection, and perhaps dip their toes in the Contemporary Art market. 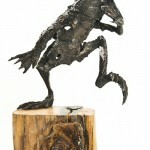 With 150 works on display it will be an exciting and rewarding time. Some may even decide to bid for a work at the auction on the 21st July and take it ‘Off The Wall’ and home to their own interior. From July to September the Museum & Art Gallery has engineered a once in a lifetime opportunity to see name-dropping art that for many a year has lain awaiting discovery by art lovers. Works by Henry Moore, Jacob Epstein, Paul Nash, Stanley Spencer, Ivor Hitchens and other great artists will be on show at Horsham Museum. The exhibition ‘A Summer of Great British Art’ is only possible because The University of Chichester Otter Gallery is closing this summer for refurbishment and Toovey’s Auction House has generously helped support this exhibition. ‘Matisse: Drawing with Scissors’ runs from 28 April – 26 May; ‘Off The Wall’ runs from 1 June to 7 July; and ‘A Summer of Great British Art’ runs from 17 July to 15 September. Olivia grew up near Powys, Mid Wales. 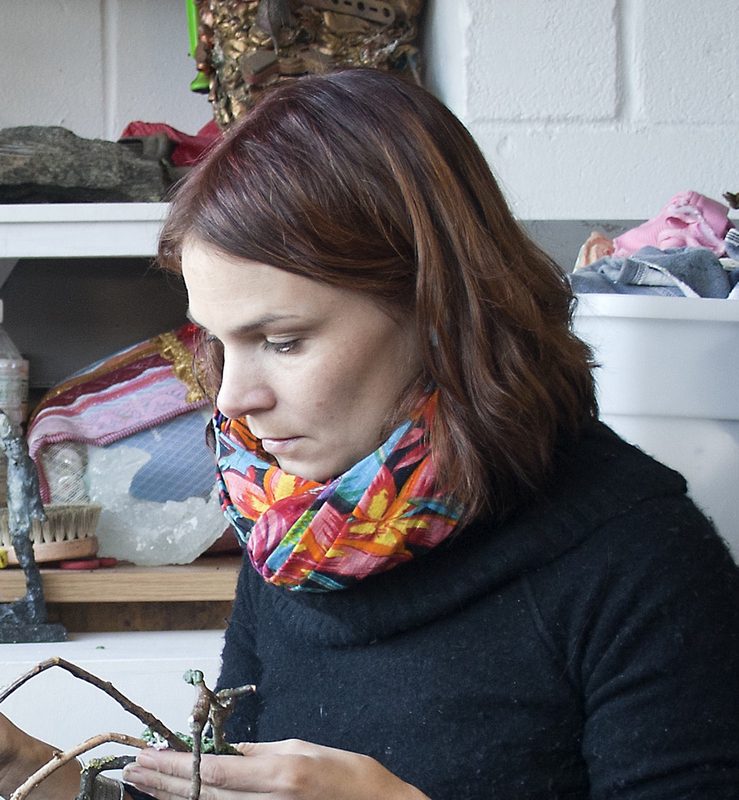 Her professional artistic career started with a Foundation course at Northbrook College, Worthing, followed by a three-year BA (hons) degree in Ceramics from Bath Spa University. 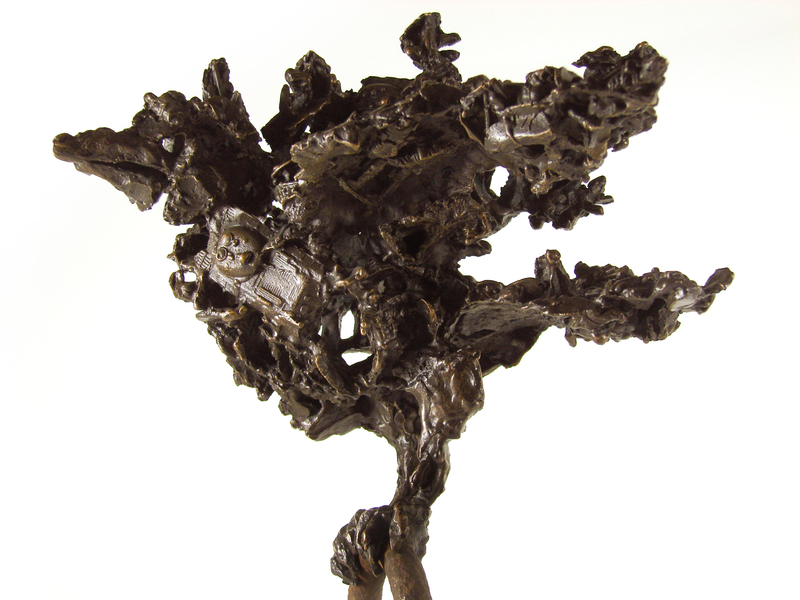 A three month residency in India followed at the Sanskrit Kendra where she first was introduced to foundries and casting. During her three years in Australia she began to seriously exhibit and sell her work. A change in circumstances meant that in 2006 she decided to return to Britain and after a summer studying at the Florence sculpture academy she moved back to Wales. On her return she was still interested and curious about metal casting and worked for a local foundry ‘Castle Fine Arts’. The encouraging staff not only educated her but provided her the freedom to experiment out of hours on her own work, gaining techniques in casting, mould-making and patination (a tarnish that forms on the bronze to create various finishes). In 2008 Olivia decided to move to Brighton, her brother and sister had lived there when she was younger but her siblings had since moved on. Knowing the town she was drawn to the sea and the creative air of the town. Instantly feeling at home in Sussex, Olivia cannot understand why anybody wouldn’t want to live in Brighton, she quips the weather is better in Brighton than in Wales too. Does Sussex inspire her? Olivia is inspired by everything, her eye often catches an otherwise disregarded object or source for a new idea, she purchased pieces of the collapsing West Pier which she hopes to turn into something at a later date. A work in progress is a bronze parrot that will finally be covered in bright spray paints inspired by the graffiti in Brighton’s North Laine. Her work is inspired by her travels and her attention to details that others may not see. 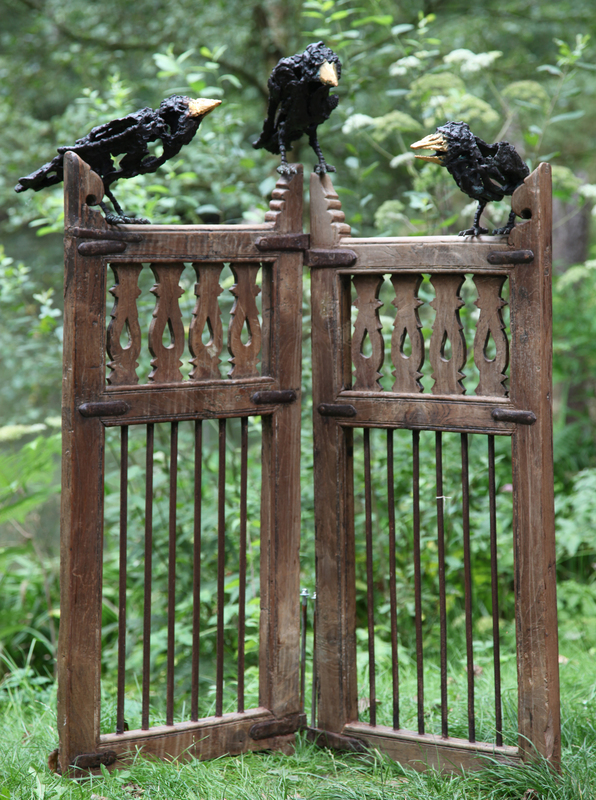 The majority of her work is still cast at ‘Castle Fine Arts’, combining creating the bronzes with visits to her family in Wales. 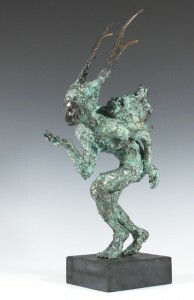 Olivia’s work is chiefly based around figures and animals (predominantly birds) cast in bronze using a lost-wax casting technique in small editions. 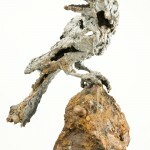 This allows her to incorporate found or sourced objects into her sculptures, such as feathers, flowers and other textural items. 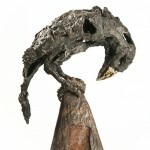 These forms are often skeletal-like as the artist wishes to capture the essence of the animal or bird. 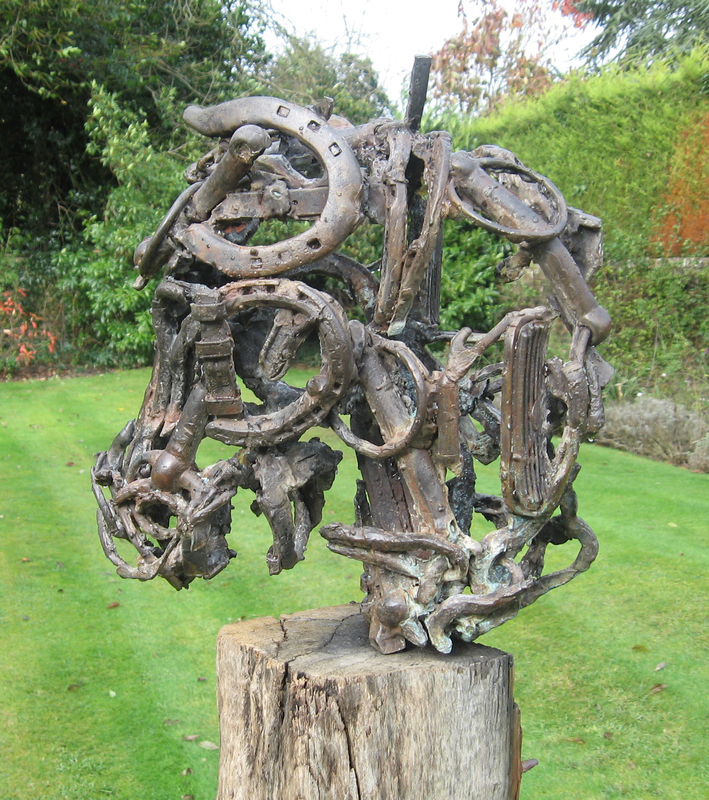 ‘Horse Head’, for example, uses castings of tack including a horseshoe to create the finished sculpture. 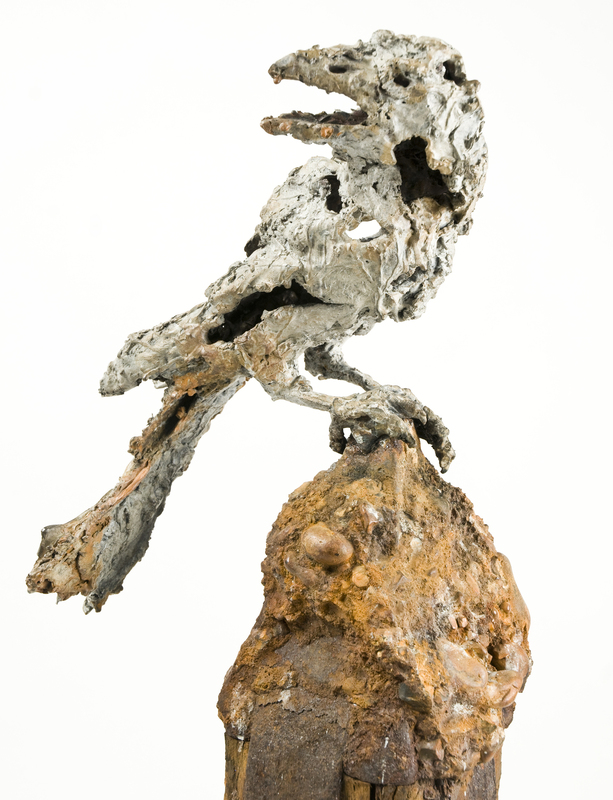 ‘Soldier Crow’ incorporated castings of small army figures and a toy tank to create the overall bird form symbolising the premature loss of life through conflict. 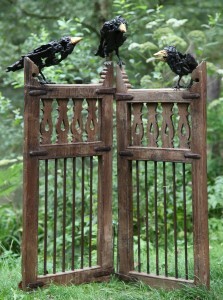 Crows are a recurring source of inspiration for the artist, a bird often associated with bad omens in the Western World. Inspired by her travels in India, particularly the holy city of Varanasi, which she describes as a “melting pot where death and life come together”. Her experiences here, created a different and more hopeful attitude towards mortality contrary to the European views of the subject “I have been inspired by the spirituality in India and the belief in the cycle of life, death, life”. These sculptures could be viewed as strange and macabre or, fragile and beautiful; to quote Aristotle “The aim of art is to represent not the outward appearance of things, but their inward significance”. As an artist, her work is undoubtedly autobiographical, investing each piece with parts of her life, including her family, travels, reactions, feelings and histories expressed through shapes, forms and symbols. Olivia became a mother for the first time last year and her work will develop in excitingly different ways as a result. 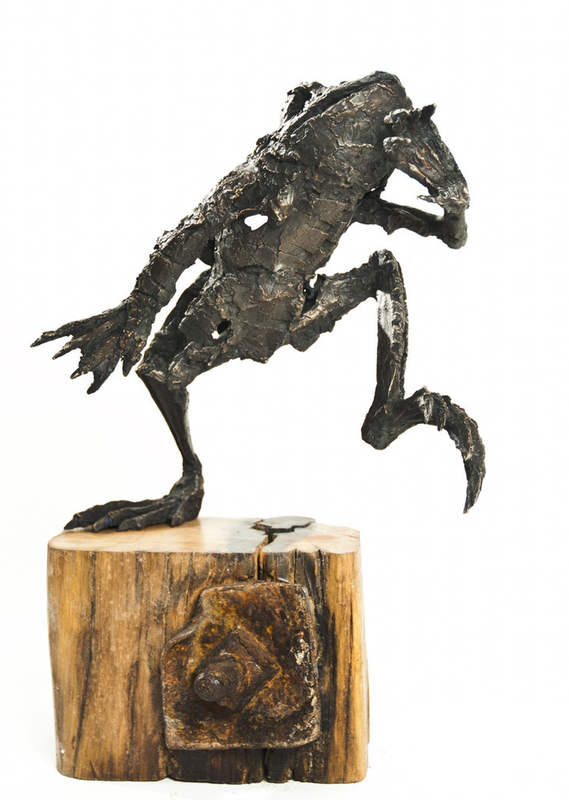 Since moving to Brighton her sculpture has been increasingly well-received gaining Olivia the Alec Trianti Special Sculpture Award, Falle Fine Art Award and the Art London Award reinforcing her status as a sculptor of note. Olivia will be exhibiting new works in a group show with six other Sussex artists at The Gallery, Cork Street, London, between the 31st April and 5th May. Her work can also often be found at Will’s Art Warehouse in Putney, and at The Sculpture Park in Surrey. Nicholas’ article was originally published in Sussex Life magazine in April 2012. Thanks to sponsorship by Toovey’s auction house and the Hayward Gallery, Horsham Museum and Art Gallery is able to host an exhibition of Matisse’s later work. Opened just two years ago the Art Gallery was a new venture for the Museum, with the hope that it would be able to offer visitors and the community of the district the opportunity to see, admire and become inspired by art. ‘MATISSE: Drawing with Scissors, Late Works 1950-1954 – A Hayward Touring Exhibition from Southbank Centre, London’ is an amazingly colourful exhibition that reveals how Matisse was one of the twentieth century’s leading artists and designers – even while bedridden he was able to create iconic work with his ‘drawing with scissors’ series. It will inspire those who find the brush and pencil a barrier to art. As the Hayward Gallery notes, “The French painter, sculptor and designer, Henri Matisse (1869-1954) was one of the twentieth century’s most influential artists. His vibrant works are celebrated for their extraordinary richness and luminosity of colour. 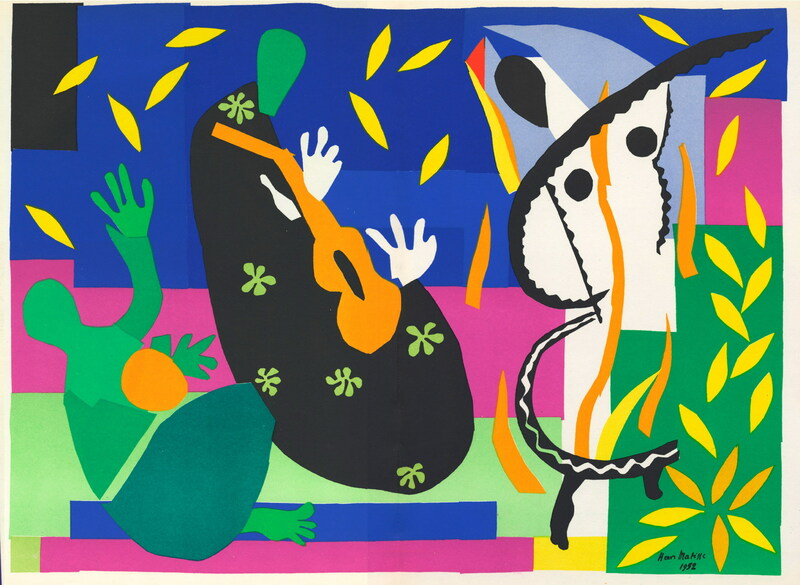 Matisse: Drawing with Scissors, a Hayward Touring exhibition from the Southbank Centre, London, features 35 lithographic prints of the famous cut-outs, produced in the last four years of his life, when the artist was confined to his bed. It includes many of his iconic images, such as The Snail and the Blue Nudes.” Matisse continued creating highly original works into his eighties. For his cut-outs he used paper hand-painted with gouache, laid down in abstract or figurative patterns: “the paper cut-out allows me to draw in the colour… Instead of drawing the outline and putting the colour inside it… I draw straight into the colour.” The colours he used were so strong that he was advised by his doctor to wear dark glasses. ‘Matisse: Drawing with Scissors’ opens on 28 April and closes 26 May 2012. For further information contact Horsham Museum. Other than antiques, fine art and collectors’ items, one of the main topics of discussion in Toovey’s Sussex saleroom is football. With the performances, refereeing decisions, goals, managers, saves, fouls, form and transfers often debated, the saleroom has on occasions transformed into an arena of football punditry. Who will be managing England at the 2012 European Championships seems to be a current hot topic of conversation. It would appear that the forthcoming summer of football and the millions wasted on strikers who can’t find the net in the Premiership seem to be overshadowing the mighty performances of one of our local teams, Brighton & Hove Albion. The Seagulls were newly promoted into the Championship this season and appear to have settled into their much-awaited new home at the AMEX stadium. The East Sussex team were founded in 1901 and originally played in the Southern League, before being elected to the Football League in 1920. Arguably their greatest spell was in the 1980’s, whilst playing in the top division they had a cup-run that took them to Wembley in the F.A. Cup where they played Manchester United, losing after a replay. The forthcoming sale of Paper Collectables on Tuesday 17th April includes Lot 3205, a large collection of football programmes mostly relating to Brighton and Hove Albion. Included in the lot is a series of programmes that follow the cup run of the 1982/83 season, including the semi-final, final and replay, these three all have the original ticket stubs for the matches included (see illustration, click for an enlarged image and again for further magnification), the lot carries a presale estimate of £100-150. In the Postcard section of the same specialist sale is Lot 3050 (see illustration, click for an enlarged image and again for further magnification). 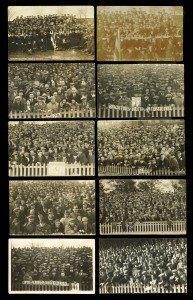 This lot comprises a group of 10 photographic postcards of crowd scenes at the football matches of Brighton and Hove Albion. Dating from 1910 to circa 1929, the majority of the cards were published by the Hove-based photographer Thomas Walter Stephen Wiles, later Deane, Wiles & Millar, or the Brighton Camera Exchange. The postcards show a different era of football, the anonymous faces looking out are dressed in their Sunday best at a time when financial investment in the sport was considerably different. It was also a different era for the Seagulls as these were taken at their former home, the Goldstone Ground. 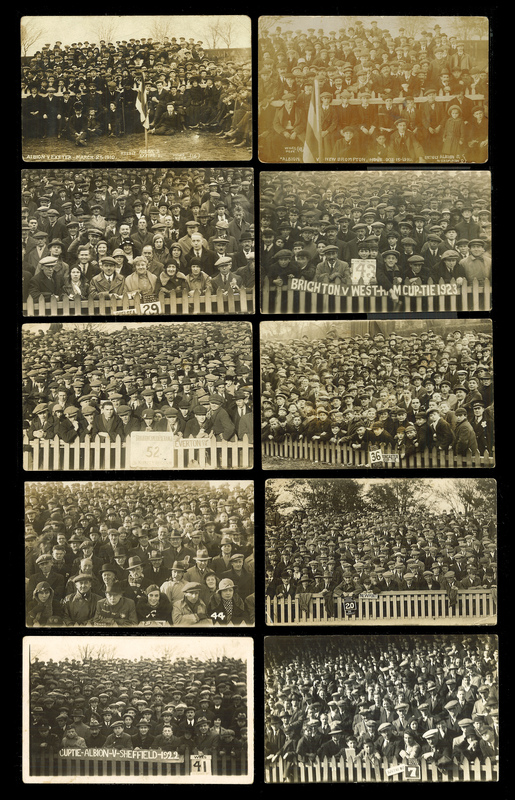 Amongst the supporters and collectors these postcards are always sought after, particularly those featuring cup-runs (as some of these do) or those against rival clubs. This lot carries the presale estimate of £50-80 and is offered alongside Stamps, other Postcards, Cigarette Cards, Autographs, Photographs and Printed and Manuscript Ephemera in Toovey’s Sale of Paper Collectables on the 17th April 2012. For viewing times for the auction please click here. Under manager Gus Poyet, Brighton and Hove Albion are currently competing for a Play-off place in the Championship, and in the absence of any Crystal Palace supporters at Toovey’s, we wish them the very best of luck!